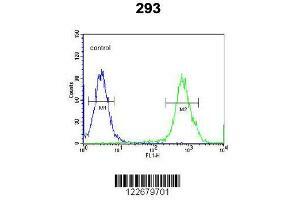 Western blot analysis of VEGFC Antibody (ABIN650694) in 293 cell line lysates (35 µg/lane). 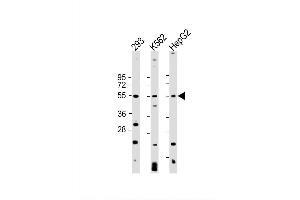 VEGFC (arrow) was detected using the purified polyclonal antibody. 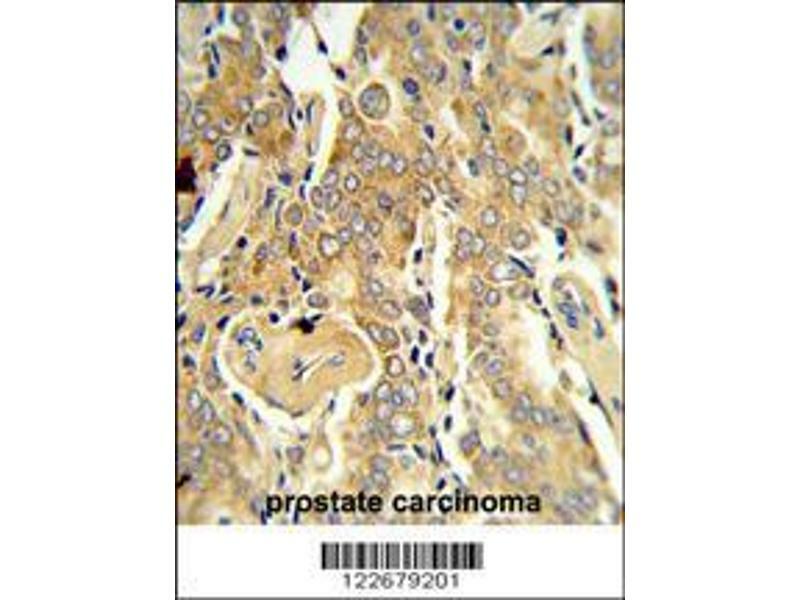 Formalin-fixed and paraffin-embedded human prostate carcinoma reacted with VEGFC Antibody, which was peroxidase-conjugated to the secondary antibody, followed by DAB staining. 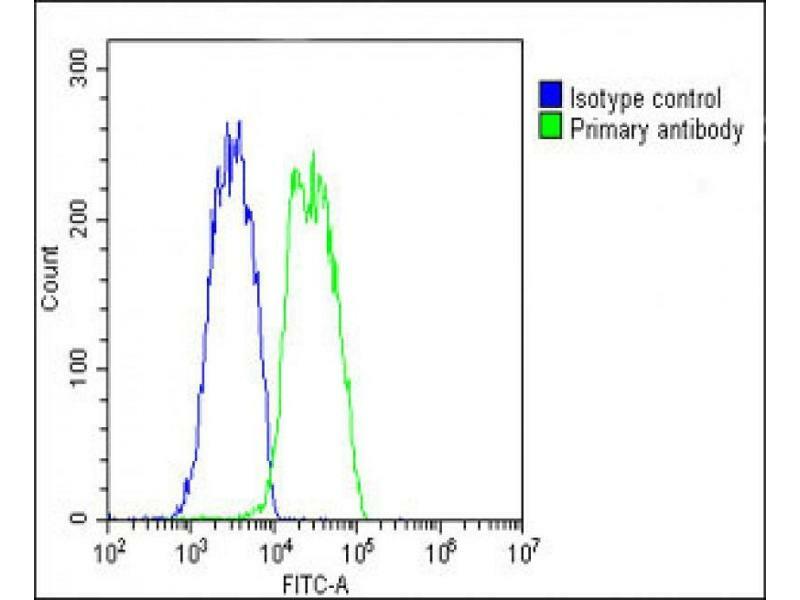 VEGFC Antibody (ABIN650694) flow cytometric analysis of 293 cells (right histogram) compared to a negative control cell (left histogram).FITC-conjugated goat-anti-rabbit secondary antibodies were used for the analysis. 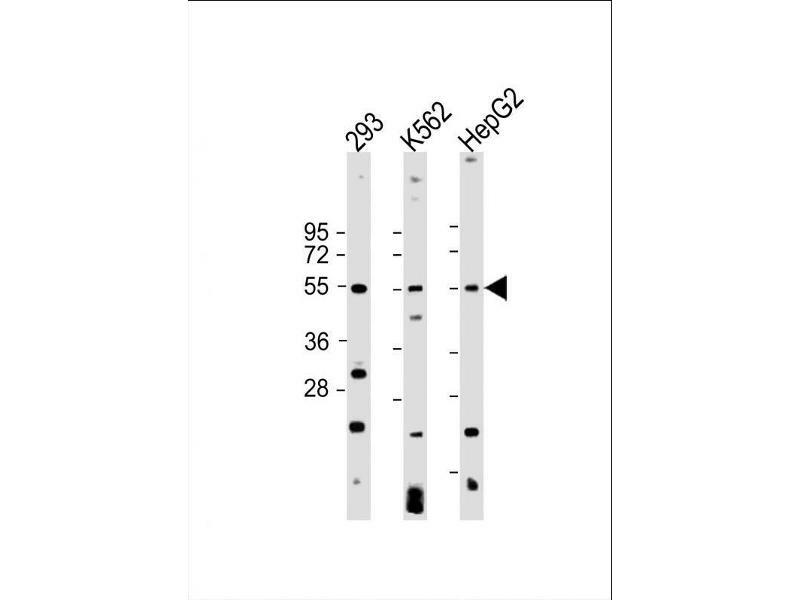 Specificity This VEGFC antibody is generated from rabbits immunized with VEGFC recombinant protein. 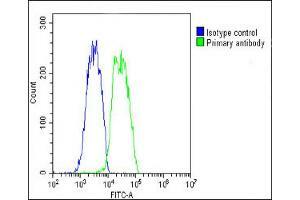 Immunogen This VEGFC antibody is generated from rabbits immunized with VEGFC recombinant protein. 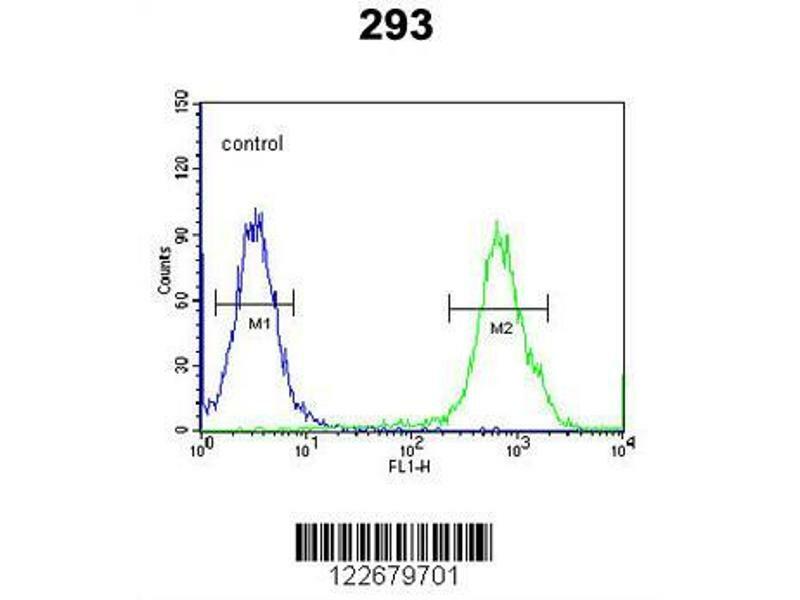 Background VEGF3 is a member of the platelet-derived growth factor/vascular endothelial growth factor (PDGF/VEGF) family, is active in angiogenesis and endothelial cell growth, and can also affect the permeability of blood vessels. 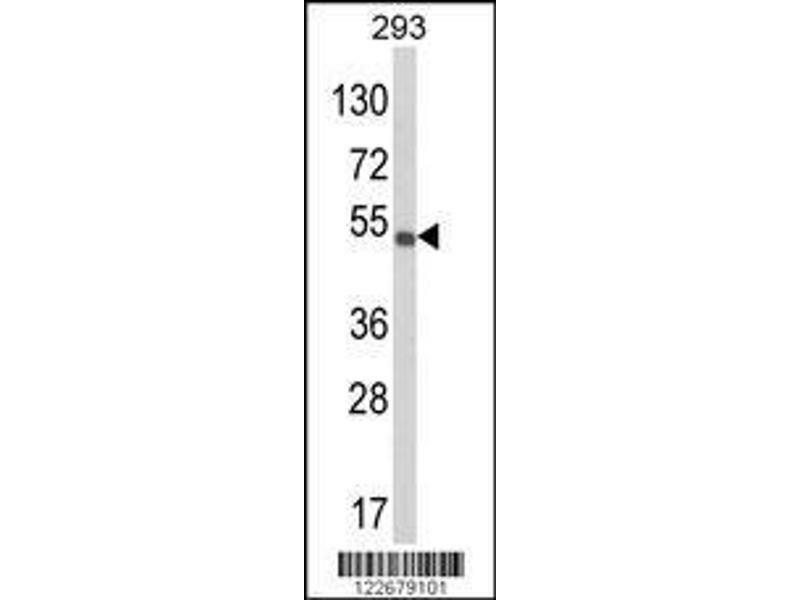 This secreted protein undergoes a complex proteolytic maturation, generating multiple processed forms which bind and activate VEGFR-3 receptors. 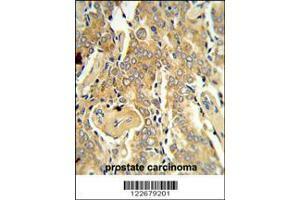 Only the fully processed form can bind and activate VEGFR-2 receptors. 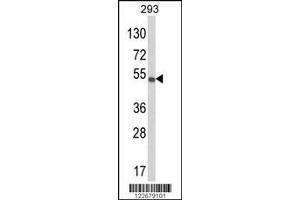 This protein is structurally and functionally similar to vascular endothelial growth factor D.